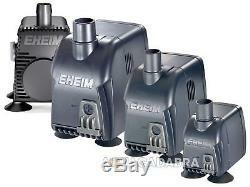 EHEIM compactON POWERHEAD SUMP RETURN WATER FLOW FILTER PUMP FISH TANK AQUARIUM. Please use the drop-down menu to select your preferred model. The following options are available from Aquacadabra. EHEIM compactON 300&###xA0;&###xA0;(replaces COMPACT 300). EHEIM compactON 600 (replaces COMPACT 600). EHEIM compactON 1000&###xA0;(replaces COMPACT 1000). EHEIM compact ON 2100&###xA0;(replaces COMPACT 2000+). EHEIM compactON 3000 (replaces COMPACT 3000+). EHEIM compactON 5000 (replaces COMPACT 5000+). The Eheim CompactON multi use pump is a high performance pump whilst maintaining low power consumption. Eheim CompactON&###xE2;&###x20AC;&###x2122; s German designed pump offers superior build quality offering more flexibility and flow rate adjustment, further more due to the ceramic bearings the CompactON gives a near silent performance. Suitable for freshwater and marine aquariums the Eheim CompactON pump comes complete with accessories for a versatile use. Ceramic bearings for near silent running performance. High pump performance with a low power consumption. Flow rate, 170 &###xE2;&###x20AC;&###x201C; 300 l/h. Dimensions (W x H x D), 30.00mm x 72.00mm x 62.00mm. Flow rate, 250 &###xE2;&###x20AC;&###x201C; 600 l/h. Dimensions (W x H x D), 38.00mm x 72.00mm x 62.00mm. Flow rate, 400 &###xE2;&###x20AC;&###x201C; 1000 l/h. Dimensions (W x H x D), 47.00mm x 79.00mm x 73.00mm. Flow rate, 1,400 &###xE2;&###x20AC;&###x201C; 2,100 l/h. Dimensions (W x H x D), 170.00mm x 142.00mm x 109.00mm. EHEIM COMPACT PLUS RANGE (3000+, 5000+). The plus stands for additional power and performance (up to 5000 l/h). And it stands for use in and out of water. These plus points mean that the pump is suitable for a variety of applications &###xE2;&###x20AC;&###x201C; for larger or smaller aquariums. The output can be adjusted as required. A replaceable coarse filter traps dirt particles. And also the quiet running, the low energy consumption as well as its suitability for fresh and salt water are important plus points. There are 3 models with adjustable pump output up to 3000 and 5000 l/h. For use in and out of water. Including inlet connectors for use out of water. Replaceable coarse filter traps dirt particles. Suitable for fresh and marine water. There are many reasons to shop online with Aquacadabra-Deals-Online. At present we list nearly 5,000 specialist aquarium & pet products suitable for Aquatic, Reptile, Cat and Dog enthusiasts. All our items listed are UK spec. We're not just an online aquatic retailer, we are also a specialist aquatic retailer with a bricks and mortar warehouse located in Crayford, Kent, and you are very welcome to visit. Open six days a week and staffed by experienced aquarists with a love for the hobby, our staff don't just manage the welfare of our live stock on site, many also have tropical and marine aquariums at home. It is only by being enthusiasts for the hobby that a true understanding of fish husbandry can be obtained, whether it is understanding the requirements of your fish or knowing the appropriate piece of equipment that you require to succeed in the hobby. One final reason to shop with Aquacadabra-Deals-Online is our inventory. When placing an order with us, you can rest assured we'll have the goods with you as quickly as we possibly can. We feel that offering a large inventory of products at competitive prices, tied to a high level of customer service and the reassurance that we are available for you 6 days a week for any fishy questions that you may have, Aquacadabra-Deals-Online is the one stop shop for all of your aquatic reptile or pet needs. Please also note it is your responsibility to get the item back to us at your cost in a new undamaged condition. When returning goods, we recommend that you use a courier or deliver them personally to our Head Office. The Company accepts no responsibility for damage that is incurred in transit when returning goods, or for goods that are lost in transit. Order Cancellation or Changes to Orders. Once an order has been placed it will be processed almost immediately. This means if you wish to cancel the order you will need to send the goods back to us once received. This listing is currently undergoing maintenance, we apologise for any inconvenience caused. The item "EHEIM compactON POWERHEAD SUMP RETURN WATER FLOW FILTER PUMP FISH TANK AQUARIUM" is in sale since Monday, September 28, 2015. This item is in the category "Pet Supplies\Fish & Aquarium\Water Pumps". The seller is "aquacadabra-deals-online" and is located in Crayford, Kent. This item can be shipped to United Kingdom, Austria, Belgium, Bulgaria, Croatia, Cyprus, Czech republic, Denmark, Estonia, Finland, France, Germany, Hungary, Ireland, Italy, Latvia, Lithuania, Luxembourg, Malta, Netherlands, Poland, Portugal, Romania, Slovakia, Slovenia, Spain, Sweden, Australia, Russian federation, Canada, Brazil, Japan, New Zealand, China, Israel, Hong Kong, Norway, Malaysia, Mexico, Singapore, South Korea, Switzerland, Taiwan, Thailand, Saudi arabia, South africa, United arab emirates, Ukraine, Chile.